Cinema Cafe is a one stop movie theater and restaurant. We combine movies with a casual dining experience featuring a full-service menu offering a wide choice of food. Choices include burgers, homemade pizzas, chicken sandwiches, wings, french fries, appetizers, fresh salads along with alcoholic beverages such as beer, wine and mixed drinks. Of course you can always get traditional concession items such as soft drinks, candy, and fresh-popped popcorn. Our full wait service is standard in all auditoriums during all features films, so there's never a need to get up from your seat or miss a single second of the movie. 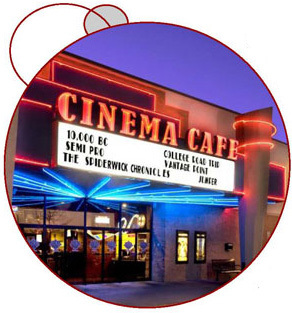 At Cinema Cafe, we now offer all premier locations - see a movie with us as soon as it hits the big screen. Our theater seating is a variety of traditional cinema chairs featuring high backs, cup holders and liftable armrests, high-back rocking leather office style chairs, or leather power recliners, depending on the location. All theaters feature DTS digital sounds and the latest in projection technology.